Brand Inspiration mock-up I created. Photo sources: 1, 2, 3, 4. Logo: Naomi. Since starting a design board on Pinterest, I've been noticing a lot of beautifully made brand boards. I found myself thinking 'hey, why don't I have one?'. 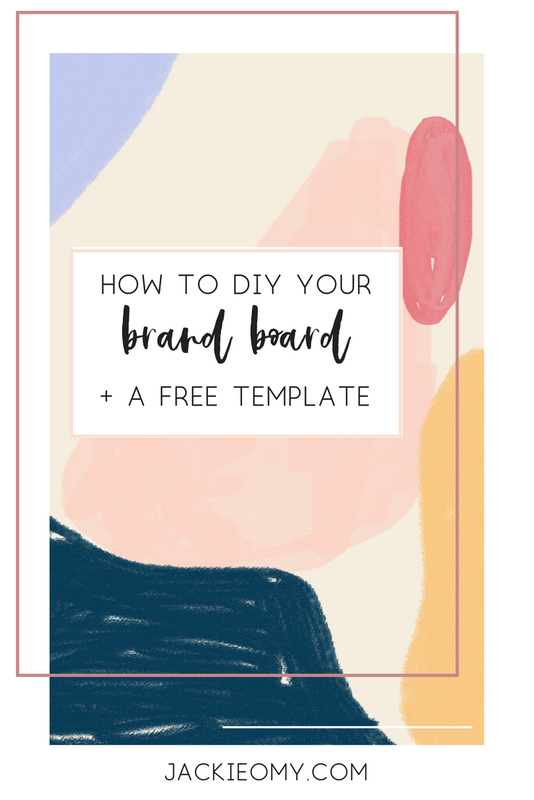 These boards are typically created by professional designers, but today I'll show you how you can DIY your own brand design kit. You can use it as inspiration for your branding now, or use it as a starting point to help a professional to refine your style later. Let's get to work! What is a brand board and why do you need one? A brand board is a document that contains all your brand design elements - color palettes, logos, fonts, the whole shebang. 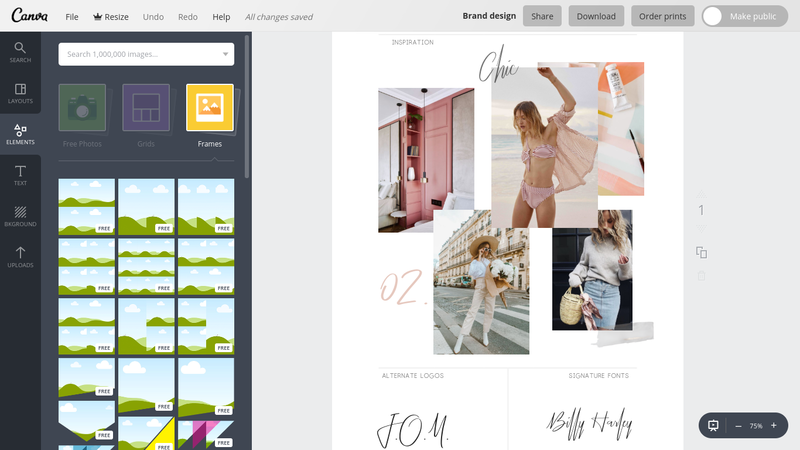 I've spoken before about the importance of branding, and a brand board really helps you get a visual feel for your website's identity - it's a matter of putting the abstract ideas in your head down on paper. It will also help as a visual reminder to stay consistent. To create my brand board, I decided to use Canva. I chose to use the info-graphic template dimensions (800px by 2000px) so I'd have a nice long area to work with. I've gone ahead and created a simple template for you to add to that canvas - you can download at the bottom of this post! Many of us are already familiar with Canva, but for the benefit of those who aren't, I'm going to use a lot of screenshots, so bear with me! Once you have your template, you can head over to Pinterest to search for inspiration. There are some really impressive boards out there, but don't worry about being fancy. This is just something for your own personal use to give you a sense of what your blog's unique aesthetic is going to be. It's standard practice to add the main logo of the brand at the very top of the board. I use the Annalee logo, which is available in my design shop. Below my logo, I decided to put the focus on color (because you can never go wrong with color). To make your palette, choose a shape you like from Elements > Shapes. I chose squares for my palette but you can be as creative as you like. After positioning your shapes, click the colored square on the white bar the the top of your page; this will display your color options. From here, you can choose your color palette. I like using Image Color Picker to find the HTML codes in my favorite photos. Design Seeds is another fabulous resource for color palette inspiration. My main palette consists of muted blush tones, but I decided to add an "accent" color section so I could have some fun with my social media graphics. 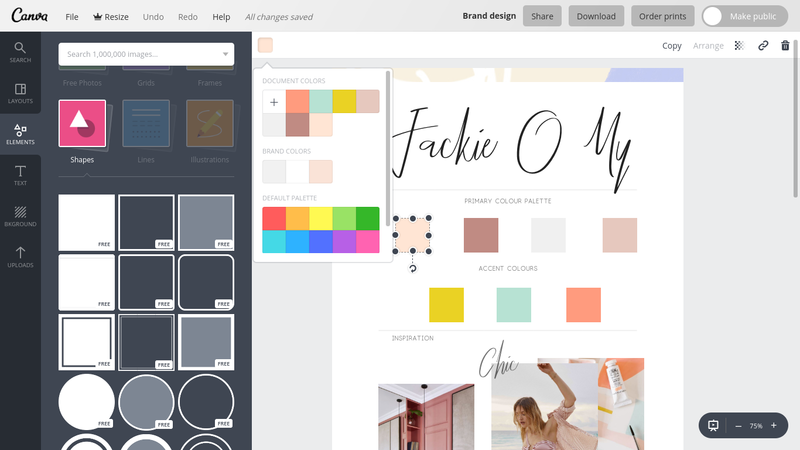 Choose a color palette that's versatile and compliments your content. Here comes the fun part! 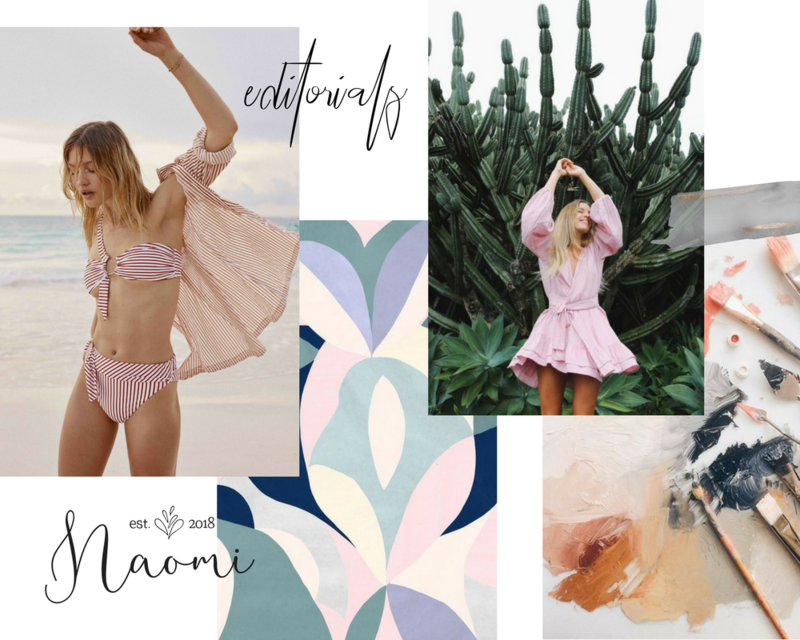 Choose a handful of photos and create a collage that showcases the vibe you want to aim for on your blog. I searched through my favorite Pinterest boards and found a few of the favorites I never get tired of seeing. Your photos can come from anywhere, but again, this board is for your own personal use; I don't encourage you to redistribute photos you don't have permission to use. To create the collage, go to Elements > Frames. Scroll until you find one you like; the rectangles I used are quite a way down! The next two sections are alternate logos and fonts. I haven't designed any alternate logos for Jackie O My yet, so I just used my primary logo font to write my name in different ways. 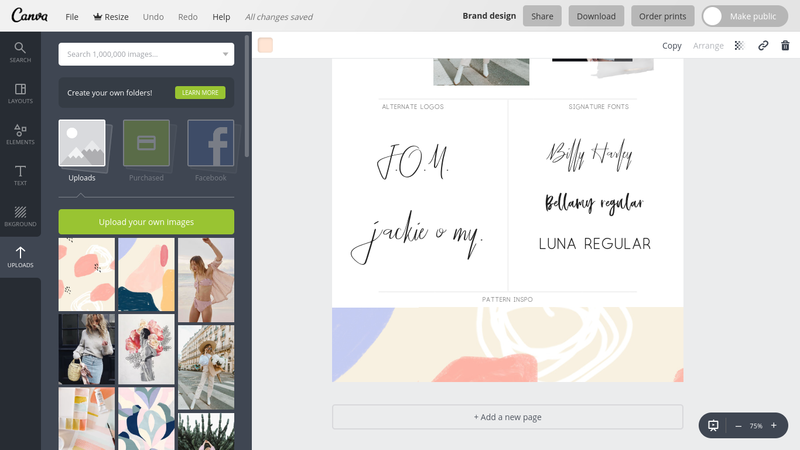 *note: It helps if you have a subscription to Canva for work; that way you can upload your own fonts. 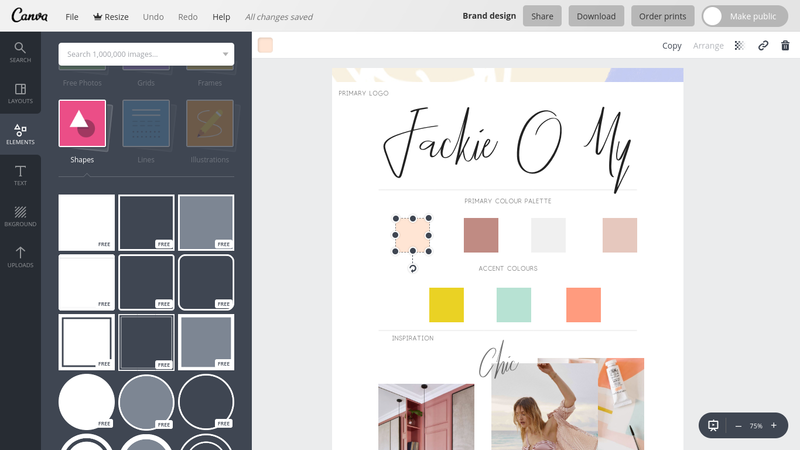 You can claim a free 30-day trial while you make your brand board, and if you set uploaded fonts as your "brand fonts", they will be accessible even after your trial ends. If you don't want to do this, no worries! There are plenty of free fonts to choose from. You can upload your photos and logos in the "Upload" section. The pattern Inspiration I used as a border is from this painted design pack, which is free until the end of the week! Download the brand board template here! Will you be taking the design plunge this week? 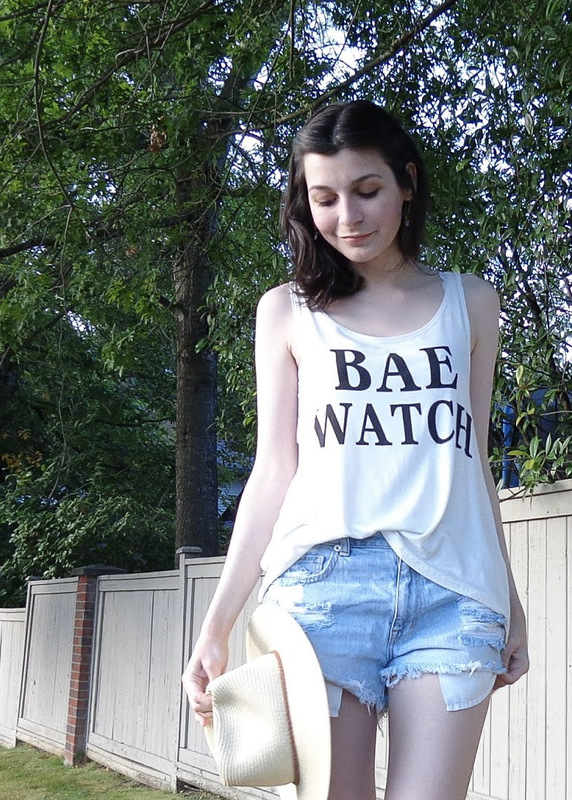 I'd love to see your brand boards! Link your Pinterest. *Note: this post contains links to items in my Etsy shop and other shops, but it is not sponsored and these items are in no way required to complete this tutorial. Have fun! I love Canva's simplicity. So much fun to try new things in.